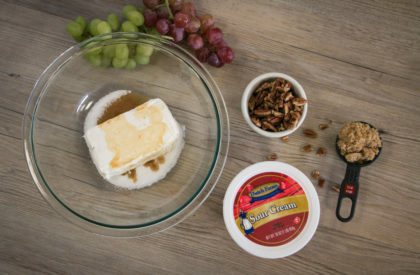 In a large bowl, beat the cream cheese, sour cream, sugar and vanilla until blended. Add grapes and toss to coat. In a separate bowl, melt butter and cool a couple of moments. Add brown sugar and pecans. Toss well. 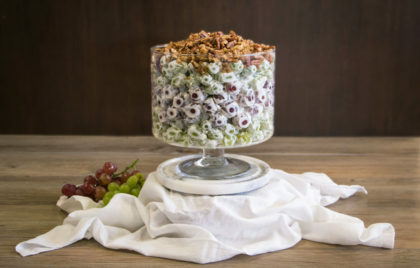 At this point you can either mix the grapes together and top with topping or for a fancier presentation (as pictured here), you’ll need a “trifle” bowl. 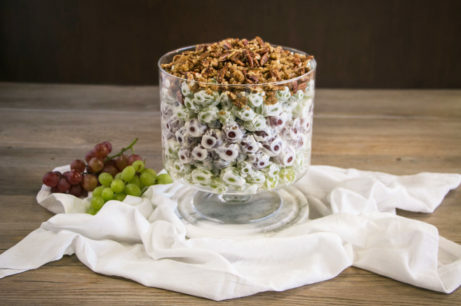 Layer half of the green grapes in the bottom of the trifle bowl, followed by a layer of the red grapes and finally, the other half of the green grapes. 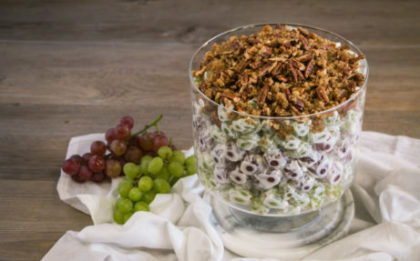 Top with all of the topping mixture, covering the top layer of the salad.